Here is the El Rio Grande Weekly Ad, valid April 17 – April 23, 2019. Don’t miss the El Rio Grande Ad Specials for this week, and bakery & tortilla offers. Regular or Marinated Meats, Avocados, Canned Mixed Vegetables, Blue Bell Ice Cream, Cooking Oils, Sun Liquid Laundry Detergent, Oak Farms Dairies, Fish Fillets, Tortillas, Poblano Peppers, Mango, Scott Paper Towels, Ensueno Fabric Softener, Crest Toothpaste, TRESemme Shampoo or Conditioner, Watermelon, Fresh Pineapples, Papaya, Limes, Fresh Guacamole, and much more. 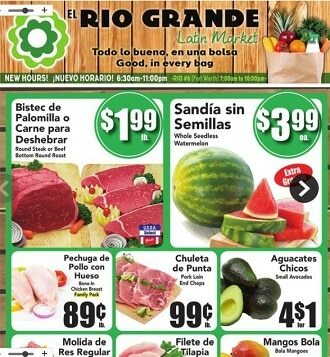 Don’t miss this week El Rio Grande ad deals and don’t forget to print off your coupons before heading out to shop.